On February 4, 2017 March 21, 2018 By felicitousfelixIn Are There Lesbians? For fans of Misfits, Crazyhead is Howard Overman’s newest creation of two badass women trying to save the world, one demon slaying at a time. Like Buffy but more irreverent and with more representation. I started watching this after a recommendation from a friend. After one episode I was hooked, and proceeded to immediately binge the entire first season (thank you Netflix!). 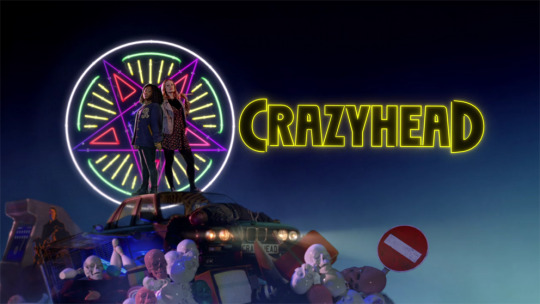 It’s a little spooky but leans more towards the urban fantasy end of the spectrum than the Horror end, but what Crazyhead is, more than anything is funny. Better than that, it also has the tendency to be surprisingly touching, especially where friendship (particularly between women) is concerned, because in the world of Crazyhead friendship can literally save your life. Now onto our main characters – Raquel and Amy. Raquel by far holds the biggest appeal for me – a chubby black girl who is constantly putting her foot in her mouth and either saying too much or the wrong thing, sometimes both. She is also shown to be very insecure, particularly where her relationships both romantic and platonic are concerned, something which proves to be her greatest weakness. While she can be quite assertive and sarcastic at times, I feel that these other, more tender qualities, prevent her from suffering overly from the Sassy Black Woman trope. On the flip side of the coin, we have occasionally bossy and awkward Amy. Her strong belief in the power of friendship has her saving the day more than once, even at the potential cost of her own life. The absolute complexity of the characters was absolutely wonderful, and there was real character growth for even the supporting characters. It wasn’t just the humans who had interesting story arcs – throughout the development of the demons ultimate doomsday plan, we see the differing and changing attitudes many of the demons have towards both the plan and humanity as a whole. The representation in Crazyhead is off the charts. While as yet, no one is clearly gay, I’m holding out hope that Raquel might at least be Bi. There are also several POC, all with prominent screen time and their own plots. There are even two interracial romances, and it didn’t properly hit me how rarely you see these on TV until they happened! Crazyhead is a truly enjoyable show, and I loved every second of it. I wanted to watch it again as soon as I finished it and can barely wait for the second season.